Compatibility: Requires iOS 10.10.5 or later. 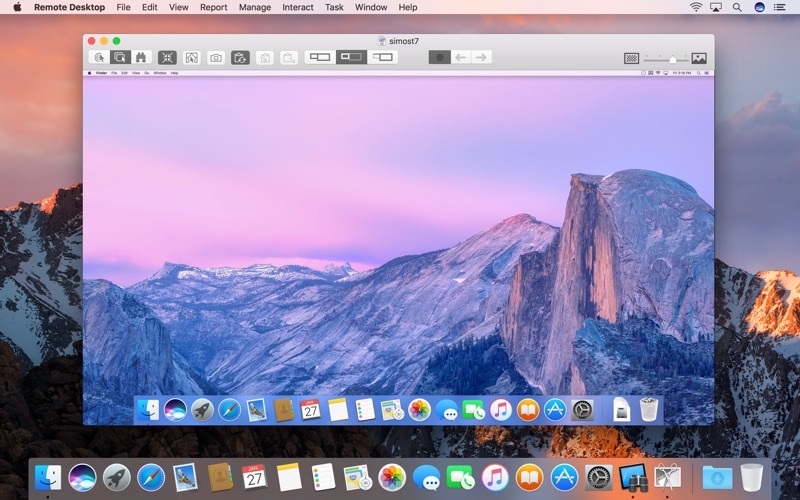 Apple Remote Desktop is the best way to manage the Mac computers on your network. Distribute software, provide real-time online help to end-users, create detailed software and hardware reports, and automate routine management tasks — all from your own Mac. Software Distribution -Easily copy and install software on remote Mac systems. -Encrypt network data when copying packages and files. -Configure a Task Server to assist with package installations on offline computers. Remote Assistance -Observe and control your Mac computers. 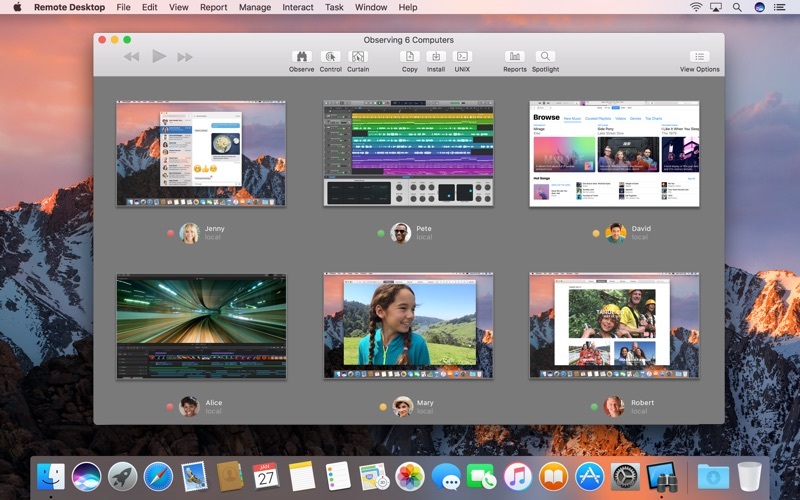 -Transfer files between Mac computers using Drag and Drop. -Copy and paste information between any two computers. -Prevent end-users from viewing the screen while you control their systems with Curtain Mode. -Control Virtual Network Computing (VNC)–enabled computers including Windows, Linux and UNIX systems. 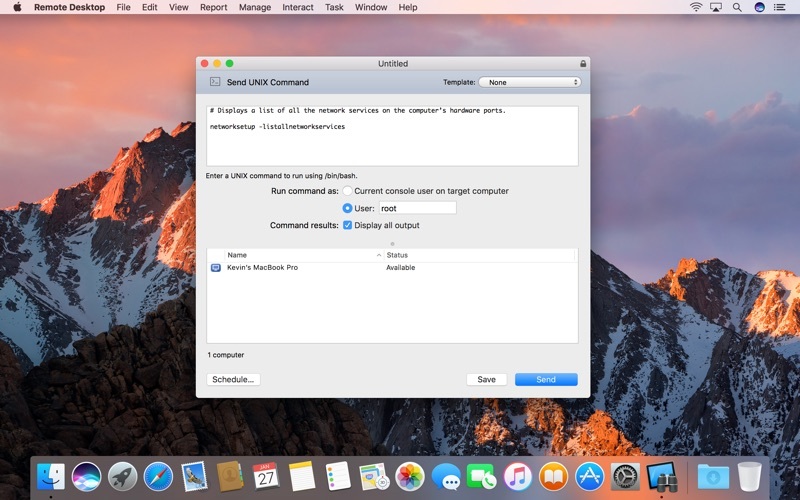 Remote Administration -Perform over a dozen commands securely on remote Mac systems. -Remotely lock screens, sleep, wake, restart and shutdown of Mac systems. -Execute UNIX shell scripts or commands on your client systems. Asset Management and Reporting -Perform lightning-fast searches with Remote Spotlight search. -Gather reports on more than 200 Mac hardware attributes. -See reports on user logins and application use. -Use a Task Server to assemble inventory reports, even from mobile systems not connected to the network. 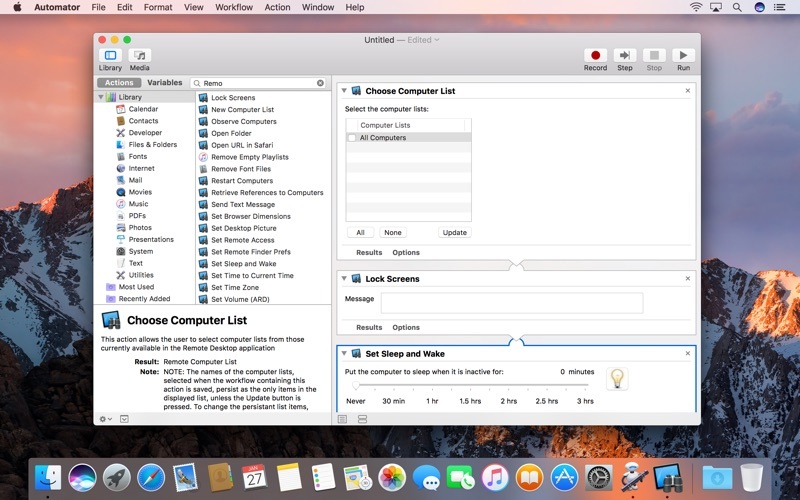 Automation -Automate routine management tasks using Automator in OS X. -Get started immediately with over 40 actions. -Chain actions together to create powerful system administration workflows. -Combine actions with other application actions to create end-to-end solutions. -Save workflows as plug-ins to provide simple, customised interfaces to Apple Remote Desktop features. As others have stated, the latest version 3.9 is very unstable. I have used it for many years as tech support in my school district. After 3.9, it crashes often and is more frustrating to work with. Some clients do not want to connect or are not available. We have been in the process of phasing out all Apple equipment. This is not just because of ARD. I'm being nice when I say that their customer/software/equipment support for education is not good. I have used ARD for a numer a years now and with the latest OS it has become extremely unstable. I use it daily in my classroom for various tasks. It shutsdown multiple times during each class. I do send all the error reports to apple but still have no fix. Any help would be exteremely appreciated. I can no longer observe multiple computers at once without ARD crashing, which kind of defeats the point. No response on the support boards, no fix offered. I use this daily - used to be an awesome app. It's gotten worse with time. I've been using ARD for a little over three years now. There have always been a couple bugs and glitches here and there, but it seems like recently it's become completely unreliable. Computers will show up as available, but then when I try to interact with them it'll say not authorized. Computers randomly (and constantly) become unavailable, even though I'm able to see in-person that they have not gone to sleep or anything. I have used (and supported) ARD in many different environments over the last decade or so....this is NOT the application that it used to be. Please, Apple, return to the Business and Education supporting platform you used to be once more! The app used to work before Mojave, but now is completelly unusable. The program opens and hangs, only force quit can be used to exit the application. Definitely needs an update from apple. Apple removed Back To My Mac from the Mojave update and mentioned this as a sutiable replacement. If all you ever do is access remote computers on the same network, then Apple Remote Desktop works fine. If on the other hand, you need to access apple computers on different networks and do not have VPN connection between the networks, this app will not work for you. Save your money and try a third party app for accessing remote computers. After upgrading to macOS 10.14 I am unable to open / run Apple Remote Desktop. Please update. Thank you!